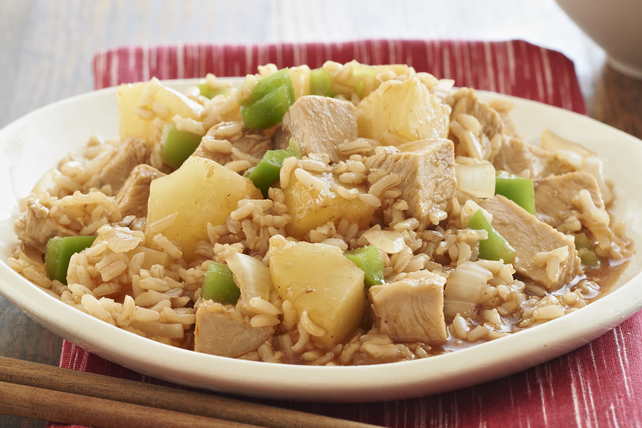 This Slow-Cooker Sweet & Sour Pork recipe is ready when you are. Prep it ahead and simmer it slowly in your slow cooker - then all you have to do is serve up tender pork, rice and peppers in a sweet and sour sauce. Place meat in slow cooker; top with onions. Add barbecue sauce and broth; cover with lid. Cook on LOW 8 to 10 hours (or on HIGH 5 hours). Stir in remaining ingredients; cover. Cook 20 min. A slow cooker should never be preheated. Simply put the stoneware container in the slow cooker base, cover and set the desired cooking temperature. Do not add cold water to slow cooker immediately after use as this could cause it to crack. Either add warm soapy water or let the slow cooker reach room temperature before cleaning. Using a slow cooker is electrically economical since it requires less energy to cook the recipe in a slow cooker than on the stove or in the oven.